Getting the power of raised beds without even breaking out the power tools. You’ve heard me talk about the importance of building healthy soil here on the podcast many times. (Most recently on Episode 123 with Mark Highland). But what if you really don’t have much soil in your backyard to begin with? Maybe you only have cement or pavement. Should you let that stop you? Or what if you’re tired of stooping down in your soil and you’d LOVE to garden a little higher up – perhaps while sitting or even standing? What if I told you that you can get a higher yield of food grown in a raised bed than you can get in the ground? Listen…raised bed gardening is not a magic pill. But raised beds certainly can take care of ton of issues that hold people back from gardening. And I want to make sure you are armed with all the pros and cons so you can tell if it’s right for you. 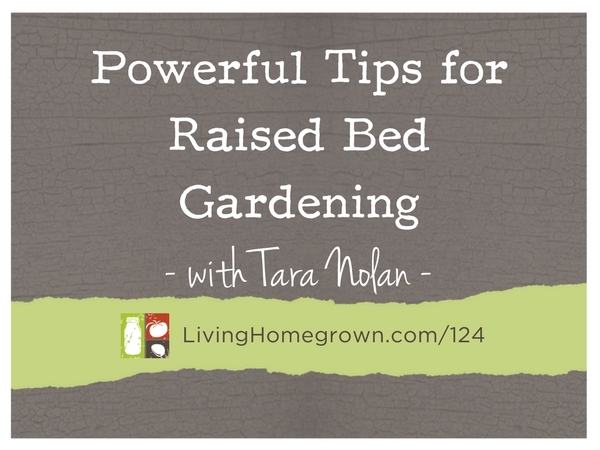 This week, I brought on Tara Nolan to share some innovative ideas for creating raised beds. Tara Nolan is a garden writer, author, editor and speaker. Her work has appeared in the Globe and Mail, the Toronto Star, Best Health magazine, CBC Life and Garden Making. 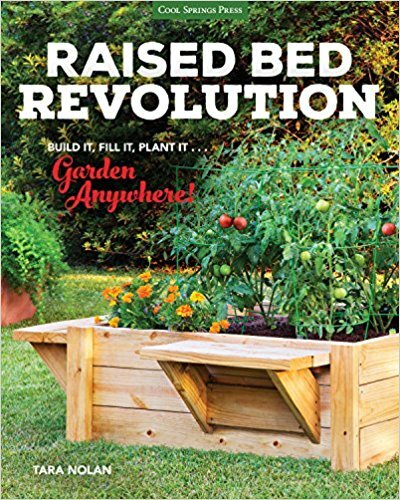 Her first book, Raised Bed Revolution: Build it, Fill it, Plant it… Garden Anywhere!, was published by Cool Springs Press in 2016 and is an Amazon best seller. 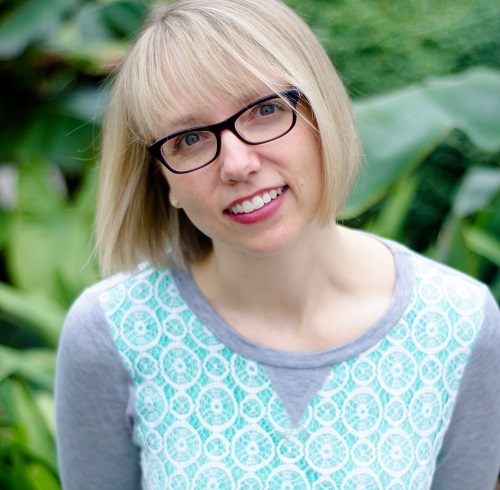 In 2013, she co-founded the popular gardening website Savvy Gardening with three other writers. It won Gold for Best Overall Digital Media at the GWA Media Awards in August, 2017. Tara was also the award-winning web editor of Canadian Gardening magazine’s website for six years. Tara is the social media editor of the Canadian Garden Council and volunteers at the Royal Botanical Garden. Measure each raised bed length, width and depth in feet. If you have more than one bed, add all your cubic feet together. Divide the total number by 27 (because there are 27 cubic feet of soil in one cubic YARD). That final number is your total cubic YARDS you need to order. If you have two raised beds that are 6 feet long, 3 feet wide and 3 feet deep, then each raised bed would hold 54 cubic feet of soil (6 x 3 x 3). Since you have two of those beds, you would need 54 + 54 = 108 cubic feet of soil. To determine how much that is in cubic YARDS, you would just divide by 27. So you need to order 108/27 = 4 cubic feet of soil. Loved the podcast and the topic. I’m confused though. Are we talking about raised beds as in a ‘box’ with wood in the bottom? or a wooden border filled w soil on the ground? One would have a bottom the other not. Thank you. We were talking about a raised bed in the garden in a box. Not a container garden where the dirt is in a container with a bottom.